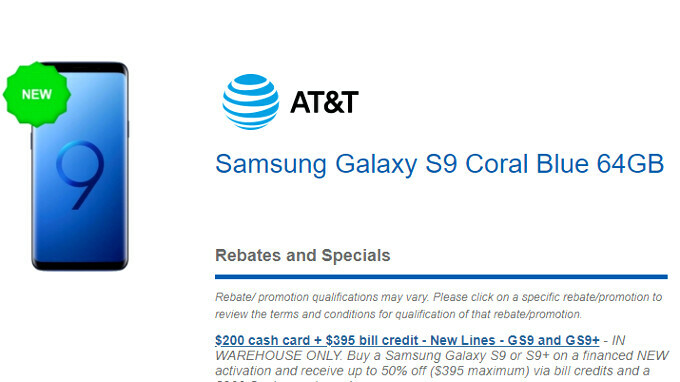 We thought nothing can top T-Mobile's Galaxy S9 deal, or Verizon's BOGO, but the awfully quiet on the promotional S9 front AT&T just burst into action, offering the S9 for $595 off when all is done and dusted. Yep, the carrier has entered a partnership with Costco to deliver you $395 in bill credits, while the retailer adds a $200 cash card, bringing the price of an S9 down to, well, $195. If you pick the $914.99 S9+, the bill credit amount will still be $395, so the larger, dual camera model will end up costing you just $320 in the end. Still great. The deal runs until March 22 in select Costco retail locations, so hurry up if you are in need of a new phone plan on AT&T, and want to get the S9 for $195, or the S9+ for $320, respectively. This just goes to show how marked up flagship phones are. No...no it doesn’t. The only thing this shows is that AT&T/Costco are willing to take a loss on the phone sale in order to recoup the amount through the monthly phone bill. The old contract days if you will. Remember too that if you cancel it you are responsible for the full remaining balance. You're right, but they are still incredibly marked up regardless. Not a fail... what you see happening right now is the consumer is refusing to pay the crazy prices of the phones that they are offering. These incentives are a way for them to make you look at this as if you can't pass this deal up. Guess it shows the same thing with all the mark downs and bogos on the iPhone too. @ Pooyath .How does it matter to you? Why are you so bothered ? Maybe you are just a depressed soul .